QuickBooks Premier is designed for businesses who want to manage their finances and improve the long-term performance of their business. 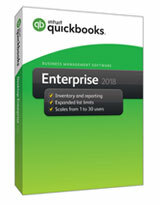 It offers a comprehensive set of tools that include everything in QuickBooks Pro, plus advanced tools and features that help you take your business further. It helps you quickly and easily create a business plan to help you get loans or financing. And it includes a sophisticated analysis tool that actually measures your financial performance against averages for your industry and make expert recommendations to help you improve it. Note: It can be installed, but is not supported in Windows 8/8.1 & 10. Designed for growing businesses and offers more capacity, improved performance and better tools to manage growth. Offers growing businesses our most comprehensive business management tools with all the features in Premier plus unlimited inventory, customers, vendors, up to 30 users, run key reports 50% faster, and much more! Offers growing businesses our most comprehensive business management tools but with the same QuickBooks ease-of-use you've come to rely on. First upgrade in 3 years. Specifically designed and optimized for business owners who use Mac computers. It has features that helps you organize your accounting needs.